Will Fitzgerald saw a last-minute equaliser incorrectly disallowed as Limerick, who led for much of the match, suffered a 2-1 defeat by Saint Patrick’s Athletic following late quickfire goals in their televised SSE Airtricity League Premier Division clash at Richmond Park on Friday night. Limerick started brightly and could have been ahead before they broke the deadlock on 17 minutes when Billy Dennehy converted a penalty, after the threatening Barry Maguire had been brought down in the box by Killian Brennan. Fitzgerald was close to extending that advantage before half-time but his volley agonisingly went wide. But with just a single goal between them the home side set about finding a way back into the game as their manager Liam Buckley made two switches at the interval. Young stopper Tommy Holland came to the Shannonsiders’ rescue when he brilliantly denied former teammate Dean Clarke – one of four ex-Blues in opposition – from close range. But with 13 minutes remaining – just moments after Eoin Wearen produced a goal-saving block on Thomas Byrne in the six-yard box – St Pat’s were handed a penalty. Following the corner which Wearen’s intervention had led to, substitute Conan Byrne was taken down close to the by-line by Darren Murphy, and he stepped up to fire to the roof of the net. Within two minutes, the game was turned on its head as Byrne planted one in the bottom corner. Limerick, though, did enough to claim a share of the spoils on the 90 when, after Kilian Cantwell rattled the underside of the crossbar with a wonderful effort, the ball back across goal was finished to the net by Fitzgerald, only for the youngster’s joy to be cut short by the assistant’s flag. However, television replays showed the winger to be in an onside position, as Tommy Barrett’s side left the capital pointless and frustrated. 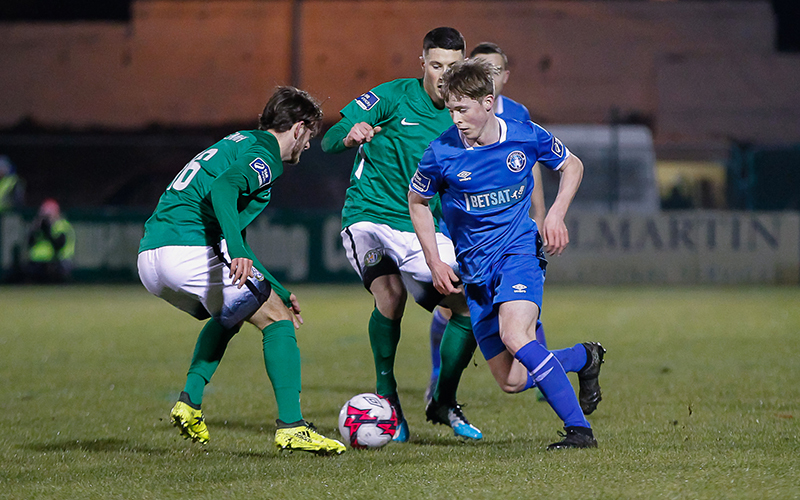 There was further annoyance for Limerick in injury-time as Cantwell’s caution means he will miss the trip to Bohemians in a fortnight; but first the Superblues must look to next Friday’s visit of Waterford to the Markets Field (7.45pm). Tickets here. Saint Patrick’s Athletic: Brendan Clarke, Simon Madden, Michael Leahy, Lee Desmond, Ian Bermingham ©, Darragh Markey, Conor Clifford (Jamie Lennon HT), Killian Brennan (Conan Byrne HT), Ryan Brennan, Dean Clarke, Jake Keegan (Thomas Byrne 75). Goals: C Byrne (77 pen, 80). Booked: M Leahy (32), T Byrne (90+2), D Clarke (90+4). Unused Subs: Barry Murphy (GK), Graham Kelly, Ian Turner, Joe Manley. Limerick: Tommy Holland, Kilian Cantwell, Eoin Wearen, Killian Brouder, Billy Dennehy, Karl O’Sullivan, Darren Murphy, Barry Maguire, Shane Duggan © (Danny Morrissey 82), Will Fitzgerald, Connor Ellis. Goal: B Dennehy (17 pen). Booked: C Ellis (86), K Cantwell (90+2). Unused Subs: Jack Brady (GK), Shaun Kelly, Shane Tracy, Adam Foley, Jason Cross, Colman Kennedy.